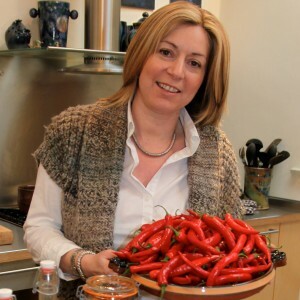 Lesley Garton is the local entrepreneur behind The Chilli Kitchen, she focuses on using top quality Jersey grown produce to create her range of preserves, in 2013 Lesley’s Twisted Sister Hot Tomato Relish won a Great Taste Gold Award. 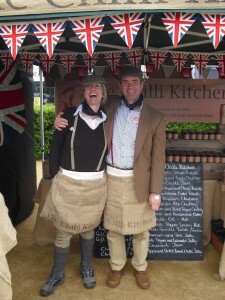 We caught up with Lesley to find out about her passion for cooking with Genuine Jersey produce. I'm Lesley Garton and I make a range of modern and traditional chutney, relish, jelly, jam, chilli sauce, chilli oil and cordial in my farmhouse kitchen on the outskirts of St Helier. I have had a passion for cooking all my life and decided to turn it into a home based business in the autumn of 2008. Being my own boss allows me time to do my own thing as well as looking after my two daughters when they need me. 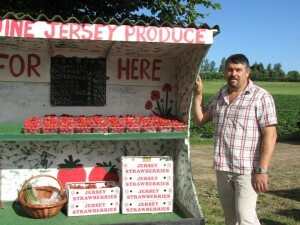 I decided right from the outset that I would use local, seasonal, Genuine Jersey ingredients and over the years have developed close ties with some fellow Genuine Jersey Members who grow really excellent produce. I use four different types of chilli from mild Finger through to extra hot Naga so many of my preserves come in different heats. Local produce is at the heart of the business. We have bramley apple trees in the garden and use them in many of my preserves, with the best seller being Indian Spiced Apple Chutney which is great in chicken, prawn or ham sandwiches when mixed with a little mayonnaise. 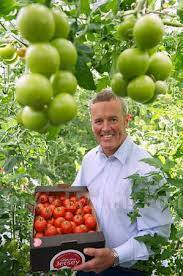 I get award winning tomatoes direct from Peter Le Cuirot who farms near Samares Manor. My strawberries, rhubarb and raspberries come from Joe Freire in St Lawrence. I get fantastic red onions and winter vegetables from Christine & Didier Hellio or Steve and Linda Carter. Red Peppers come from Paul Blake. 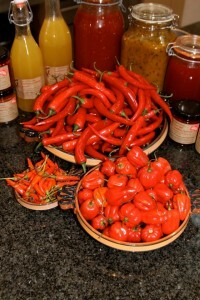 Finger chillies, Thai and Scotch Bonnet chillies from Trevor Le Brun at Homefield. My hottest Naga Chillies come from David Blake and Charles Gallichan. I also enjoy trading fruit from trees in customer's gardens with their favourite preserve and have swapped damsons for Hot Chilli Pepper Sauce and pears for Twisted Sister Relish! On a typical work day, once my two daughters are packed off to school, I can often be found prepping veg for a chutney or relish in the morning, which I then cook and jar soon after lunch before collecting the girls from school mid afternoon. Orders are placed with my farmers in the evening and the jars are hand labelled first thing in the morning often before the school run. At weekends my husband, John, and I can often be found selling at the Farm & Craft Markets where we have a tasting table to help customers find the right preserve for them. 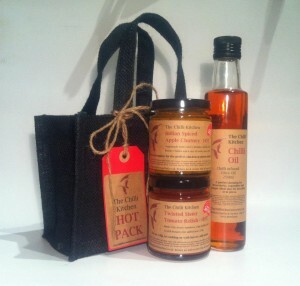 The most popular item in my range has got to be Twisted Sister Hot Tomato Relish. It’s made with award winning tomatoes from Peter Le Cuirot, Thai and Scotch Bonnet Chillies from Trevor Le Brun and smoked paprika - the first taste is of fresh tomatoes, you then get a double kick from the chillies and it ends with a smokey flavour! Customers use it to heat up pasta, Bolognese or chilli con carne, as a dip or relish, and I love to mix it with mayonnaise and dip chips into it. I was really pleased to have won a Great Taste Gold Award for it this year and have recently secured the Trade Mark for the words Twisted Sister which will allow me to develop the product further. Chilli Kitchen preserves can be found at Holme Grown Farm Shop in Grouville, Classic Herd Farm Shop in St Peter, The Spice House in the Central Market, Meyer & Son in Les Quennevais Precinct, Cooper Coffee Café at Castle Quay, The Fresh Fish Co at La Collette, La Belle Gourmande in St Aubin and on-line from www.valleyfoods.je.